"If we could first know where we are, and whither we are tending, we could then better judge what to do, and how to do it." I ran into this quotation in researching Presidents' Day wisdom for our social media posts. As I thought about it, I realized it's a perfect example of the exercises our Board and Advisory team are undertaking during the first quarter of 2019 to reflect on our first three years as a non-profit and examine how we want to proceed in the years to come. For several weeks now, we've been reviewing our past efforts, our practices and processes, and yes, even ourselves to document what we do well and what we could do better. We've also identified a number of opportunities available to us that need to be prioritized and acted upon ... and most importantly, perhaps, outlining the obstacles to our success. No stone is being unturned and our ultimate goal is to formulate a fresh, challenging, yet successful plan for the coming year and well beyond. This plan will touch all aspects of what we do. Board processes. Volunteers. Development. Communications. Mission and goals. We look forward to the changes and challenges this effort brings and will be excited to present it to everyone as the details become firm. We know we do good work and we know from the many military men and women who've responded to us that we do make an impact. This will ensure that we can do even more, even better, for even longer well into our future. Hearts in a Box is thinking out of the box. Buckle up, folks! 2018 Bigger and Better Than Ever! Another year is in the books and we're thrilled to announce that it was better than ever! We can't thank our sponsors and volunteers enough for all the contributions they made throughout the year to make it possible. On the Saturday after Thanksgiving, we shipped 218 boxes weighing over 2300 lbs to units in all branches except the Coast Guard, which for the second year in a row did not have any units requesting support. In addition to shipments to the Middle East (Kuwait, Syria, Iraq, Afghanistan, and UAE), our care packages went all over the world -- Djibouti, Niger, Japan, Poland, Norway, Cuba -- just to name a few. land, the home of the free. Thank you for all you do and your people will be in my prayers always." And THAT is what we're all about. Why we do what we do. And why we are so grateful for the support we receive from all of YOU that helps us support all of THEM! Happy New Year ... looking forward to a 2019 that exceeds all of our expectations again! We're pleased to announce our newest program - Sponsor-a-Box! Last year, we shipped ONE TON of food, personal care items, and entertainment to Americans deployed globally in all branches of the military. 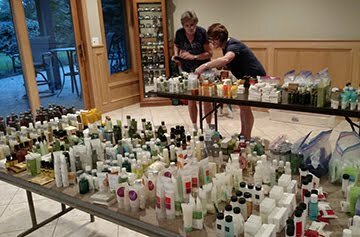 That equated to 208 boxes and about $3500 in shipping costs alone– and in 2018, we want to beat that total! This year, the cost to ship just one care package is approaching $20 … and this is where we need your help. To offset our greatest expense – shipping – so that we can focus on what goes into the care packages, we are having an ongoing Sponsor-a-Box fundraiser. 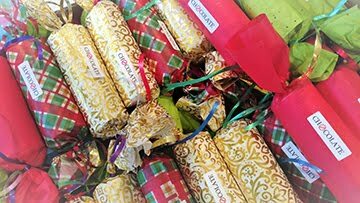 For a donation of just $20 per box, we will fill and send a care package to an American military unit in time for the December holiday season. Basically, you pay shipping, we pay to fill it with goodies, and we do the heavy lifting! It’s a simple way to show your support of our military, while letting us take care of the details. If you choose, we'll include a personalized note from you in all boxes you sponsor and we'll keep you posted on the packages journey, including where it's going (if provided by the unit) and will let you know about any feedback we get from your unit. For those of you doing this for your organization, we can provide photos and results of our 2018 efforts for your own website and communications. Corporate sponsors will be also belisted and linked on our website’s Sponsors page. If you'd like to participate, you can download the attached Word form, fill in your information, and return it to us with your donation via the instructions on the form. 3rd Annual HIAB Fish Party Nets Major Support! Our third Fish Party since becoming Hearts in a Box is in the books and we want to thank everyone who helped make this our most successful event yet! Shout out to those who helped plan and set up the event, to those who brought delicious dishes and beverages to share, and especially to those who attended and helped gather 100s of awesome box-filling products and - are you ready - raise OVER $2800 to help fill and ship our care packages this fall. The party was held on Saturday, August 25, under cloudy, threatening skies, but Mother Nature cooperated in the end and just a spritz of rain came. Over 70 family members and friends, old and new, enjoyed the summer evening and a non-traditional Fish Party meal of brisket and pulled pork BBQ. We introduced a new program at the party - Sponsor-a-Box ... and we were so happy with the reception it received! For $20, individuals or families can sponsor a box, and if they choose, our team will contact them to include the sponsor's personal message for the recipients and will also share any feedback we receive from their sponsored unit. This year marks a transition for this long time tradition. While the Fish Party will always be an important part of our history, next year as our Alaska fishing crew considers selling their fish camp, we will be saying goodbye to fish and hello to a new theme. If this year is any indication, no one will starve. For supporters who sponsored a box, we will be in contact with you in September or October regarding your box so that you have time to prepare a card or letter to include as the first thing they see when they open the box. We will be running the Sponsor-a-Box program indefinitely, so if you'd like to get involved, click HERE. 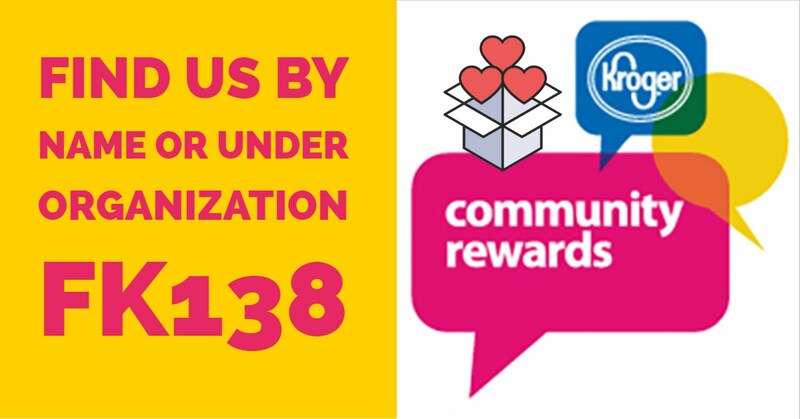 We were notified recently by Kroger that our NPO number for Community Rewards has changed to FK138. For those of you who are already signed up under our old number, there's nothing you need to do. Kroger is permanently cross-referencing the old and new numbers for your convenience. If you haven't signed up for this program yet and you shop Kroger regularly using your Plus Card, you can sign up easily at www.krogerrewards.com. Look for us by name or by NPO number FK138. Afterward, when you shop at Kroger using your Plus Card, Kroger donates a percentage of the value of your purchases to Hearts in a Box. What an easy, care-free way to help us provide our military men and women hundreds of care packages full of goodies during the holiday season. The contributions we received from Kroger last year helped us ship extra boxes over our original goal. 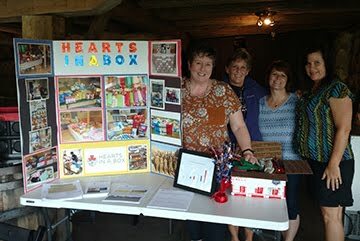 On August 1, the Wednesday Night Tee Party Golf League held their annual charity golf outing and this year, Hearts in a Box was their chosen beneficiary. 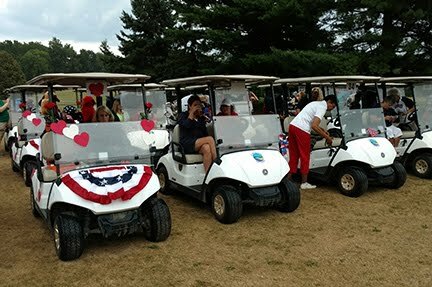 The ladies league plays weekly during the summer at Rolling Meadows Golf Course in Whitmore Lake and every year, they select a non-profit based on nominations submitted by their members. Their committee then reviews information provided by each non-profit and the general membership votes to pick ultimate designee. We were honored and excited to learn that they chose our organization! Several HIAB board members and volunteers attended and enjoyed seeing the excitement and passion everyone has for supporting our military men and women. These generous and welcoming women raised over $2000 for our program ... an incredible effort that will make a huge difference in helping us meet our goals for shipping this year! On behalf of our board and the Americans we support, thank you to everyone involved with the league who made this successful evening possible! You Drop It, We Ship It. Our Donation Drop-Off Locations are Ready for You! Do you or someone you know travel a lot? If you're like most of us, you probably collect all the little hotel freebies -- the shampoos, conditioners, lotions, manicure kits, and so on. If you're also like most of us, they usually get tossed into a box at home and rarely used. Meanwhile, our men and women deployed to remote locations often do without these types of items. 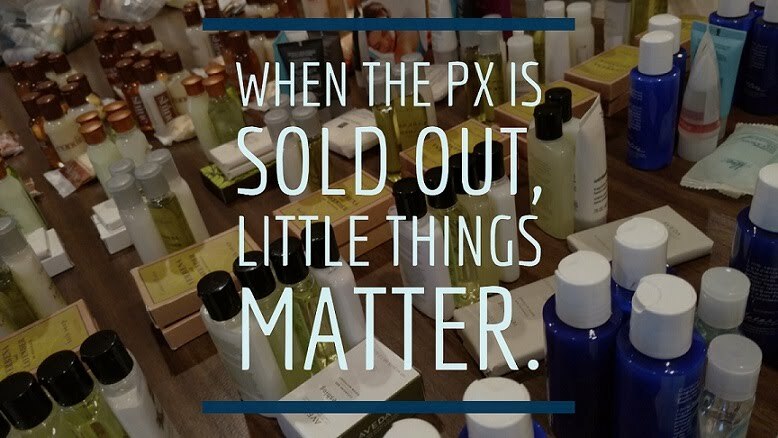 We hear from many that their bases don't have a PX or they're out in forward areas on patrols and return to stores that are already sold out. 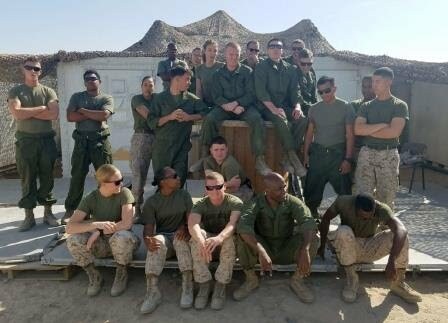 Surprising Fact: The US Military doesn't operate like a hotel! You may not even have realized that simple things like shampoo, soap, feminine protection, and other personal care items are not routinely available for some of our troops. You can help us fix that! We're pleased to announce two new Product Donation Drop-Off sites in the Saline and Ann Arbor/Ypsilanti area! You'll find a drop-box at these locations and you can swing by them anytime to donate toiletries and other items we need for our care packages. Download the attached flyer to learn more about this program and see a full list of the items you can drop off for our troops! Please share with family, friends, and co-workers who might be interested in helping ... it's a great project idea to share with scout troops, church organizations, or even your employer if they're open to it. If you have a batch to donate but can't get to these locations, please email us at contact@heartsinabox.org and we'll try to arrange other options for you! Thank you for your help in supporting this new effort ... and thank you to our friends at Brewed Awakenings and Jafferson Computers for being our eager partners! 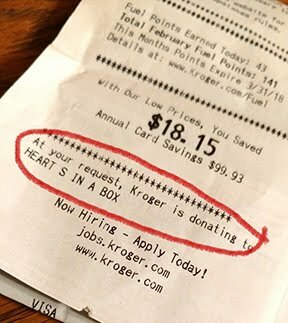 It's Time to Check Your Kroger Rewards Charity and Make Sure It's Hearts in a Box! We started our Kroger Community Rewards program almost a year ago and we've received some welcomed financial support thank to your shopping and claiming us as your charity. Just in case you forgot, Kroger requires that you re-establish your charity every year. It's easy to check on your status! The next time you shop Kroger, save your receipt and look at the bottom. If it says you're supporting Hearts in a Box, your're still okay. If it doesn't, then you should reset your selection on your Kroger account summary. If you haven't signed up yet and you have a Kroger Plus Card, you can easily link it to Hearts in a Box so every time you shop at Kroger, eligible purchases will trigger a donation to us that will help fill and send care packages to our troops. 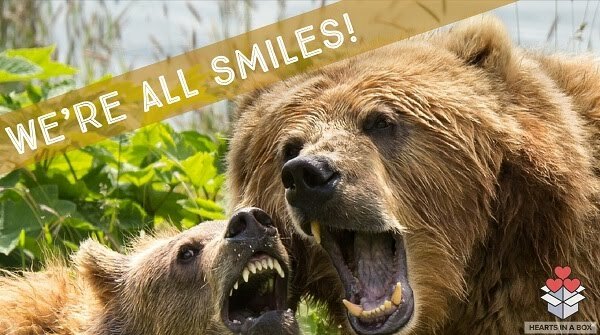 Kroger guarantees a quarterly donation of $25, but let's not stop them at that amount! Sign up today and help us while you shop without even having to think about it - just be sure to use your card or your alternate ID (account phone number) when you check out. Our Kroger NPO number is: FK138. Use this to find and select us when setting up your Community Rewards information. Register or update your account online at krogercommunityrewards.com. Current online Plus Card customers can click Sign In and add/update their Kroger Community Rewards selection under Account Settings> Account Summary, and by making sure that their account is tied to a Plus Card and Phone Number. New online Plus Card customers can click Register and complete the process for setting up a Plus Card online account, entering the Community Rewards information at the end. If you don't have a Plus Card, you can get one at the Customer Service Desk at any Kroger. Your Community Rewards selection must be re-confirmed annually and we will notify you regularly about the need to do this. Thank you for your continuing support of our mission and our programs! 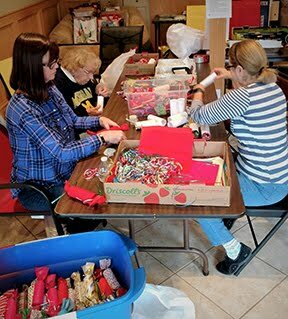 The volunteers of Hearts in a Box really enjoy the ups and downs and hard work involved in getting ready to ship care packages to our troops each year. We know there's no expectation of a response because we have total faith in our shipments making it to their destinations. The best gifts we get are those unexpected responses from the men and women who received our care packages. It's fun to read more about them ... whether it's a quick line to say "thanks!" ... or a longer missive that tells a story, we appreciate the time and effort they take from their busy and important work to let us know they enjoyed what we sent. We received a lot of feedback this year. Here are some highlights, with many other letters still in reserve to show later, too. ecided to send you an email as well. 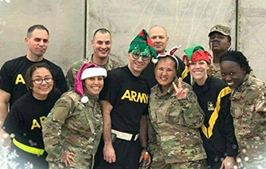 "Thank you so much for your holiday box to the Head and Neck Trauma team at the Combat Support Hospital in Baghdad!! We appreciate your generosity and thoughts!"